Ideal for children aged 9 to 14 years old and all Harry Potter fans! 4-level tower features movable Grand Staircase spiral steps at its base, potions room, treasure room with chest and a turret featuring the Mirror of Erised with changeable pictures and roosting spot for Fawkes. Includes 10 minifigures: Harry Potter, Ron Weasley, Hermione Granger, Draco Malfoy, Susan Bones, Professor McGonagall, Professor Quirrell with dual Lord Voldemort face, Hagrid, Albus Dumbledore and Nearly Headless Nick Also includes buildable Basilisk and Fawkes creatures, plus Hedwig and Scabbers figures Accessory elements include 7 wands, 3 tumblers, an umbrella, lantern, broom, sorting hat, cauldrons, potions, candles, 2 wizard brooms, food, trophy, teapot, chest and a spider and a boat with hanging lantern Travel to the legendary Great Hall of Hogwarts! 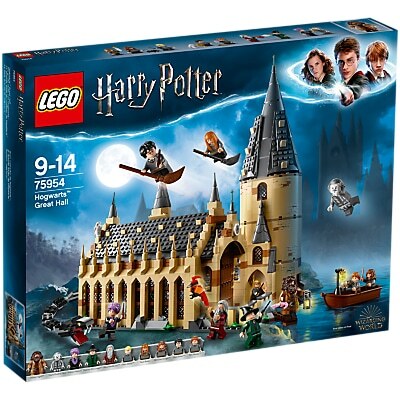 One of the most famous backdrops of the Harry Potter books and films, with the LEGO 75954 Harry Potter Hogwarts Great Hall set you can gather for a feast in the Great Hall and get ready for the sorting ceremony before drawing wands for a duel with Draco Malfoy! Climb the moving stairs to explore the Grand Staircase tower, master the art of potions in the classroom, discover changing reflections in the Mirror of Erised and help Harry, Hermione and Ron as they battle the evil Basilisk and he who must not be named… Lord Voldemort!